The Doctor turns bank robber when he is given a task he cannot refuse – steal from the most dangerous bank in the cosmos. With the help of a beautiful shape-shifter and a cyber-augmented gamer, the Doctor and Clara must fight their way past deadly security, and come face-to-face with the fearsome Teller – a creature of terrifying power that can detect guilt. Peter Capaldi is the Doctor in Time Heist. 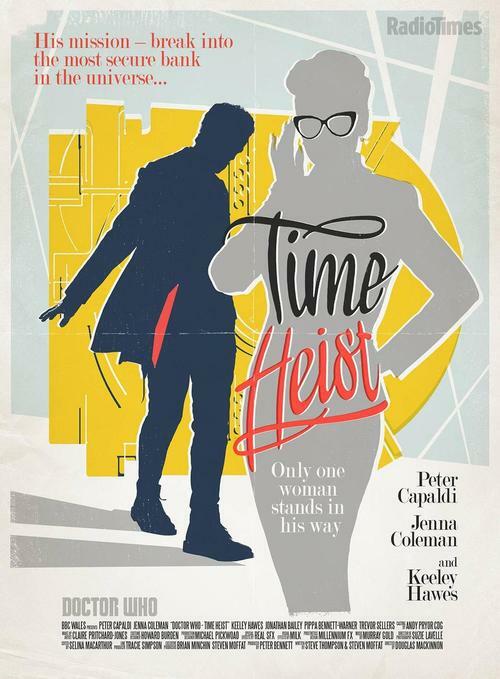 The plot of Time Heist is exactly what it says on the tin. The Doctor and Clara find themselves involved in a plot to break into the most secure and impregnable bank in the galaxy. Written by Stephen Thompson and Steven Moffat, the plot involves memory wipes, a misfit crew forced to work together, and a nasty head of security who protects the bank’s assets through the most brutal of means, all tied together with a bit of time-travel shenanigans. The episode is a series of sequences and twists, with a unique spin on the end goal of the robbery. 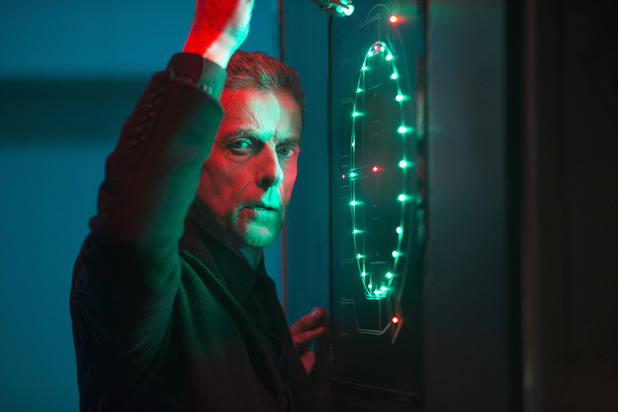 The story almost takes full advantage of the heist genre, falling just a bit short, but that doesn’t stop Time Heist from being yet another strong episode for Peter Capaldi’s Doctor. Stephen Thompson is the writer of two Eleventh Doctor episodes; The Curse of the Black Spot and Journey to the Centre of the TARDIS. Both episodes had can’t miss premises (the Doctor on a pirate ship/Clara and the Doctor racing to the heart of the TARDIS to prevent its self-destruction), but both also fell short of their full potential, acting more as montages of scenes and concept than a cohesive story. Time Heist, with Steven Moffat on board as co-writer, boasts a twisting plot that’s complex enough to hold the viewer’s attention without folding and turning back on itself long enough for them to lose interest or focus. The initial hook of the Doctor and Clara voluntarily having their minds wiped so that they go into the bank heist not knowing anything grabs the viewer from the get-go. From there, the plot moves very quickly, and thanks to the directing by Douglas McKinnon (who also directed the previous episode Listen), the pace doesn’t slow down, even when the onscreen action does. This is one of those episode where every penny of the budget was put on screen (although it seemed every patron of the most secure bank of the galaxy was human or humanoid, some alien diversity would have been nice), and McKinnon utilizes the scenery, sets, and props in every single shot. The only time the episode really falters in in the middle of the story; from when they break into the innards of the bank through the final cracking of the vault, there’s an awful lot of corridor running. It’s broken up by a scene with the Teller in his jail cell, but other than there, the four find themselves splitting up and running for their lives more often than necessary. And it also showcases one of the major flaws in the story. For the most secure bank in the galaxy, it’s really not. The tunnels should have had guards throughout them, and I would imagine a lot more security cameras and what not. I’ve seen Target pharmacies with better security against people buying cold medication to make methamphetamine than this bank. The supporting cast is one of Time Heist’s highlights. One of the more unique creatures in Who history, both in terms of appearance and abilities, is introduced in the Teller, who can read a person’s emotions and remove their memories while turning their brains into “soup,” as the Doctor calls it. The Teller’s unique look, like he could have walked out of Pan’s Labyrinth, and the way the skulls of his victim’s cave in once he’s done with them, both are sights that will stick with a viewer long after the conclusion of this story. On the human side of things, noted English actress Keely Hawes, who played the female lead in the critically acclaimed BBC series Ashes to Ashes, plays the cold, calculating, and politely vicious head of security for the Bank of Karabraxos, Ms. Delphox. Hawes nails the detached nature of Delphox, who goes about her business with efficiency, but always with the quiet desperation that one breach of security could see her suffer under the gaze of the Teller. Delphox is a very memorable one-shot villain, but one that will be easily forgotten after a few episodes have gone by. It’s not any slight against her performance, it’s just that her performance fits the standard “security chief in a heist movie” cliché to the utmost. On the side of the bank robbers, noted British theater actress Pippa Bennett-Warner plays the shapechanger Saibra and prolific theater and BBC television actor Jonathan Bailey is the cybernetically enhanced Psi. Their reasons for accompanying the Doctor and Clara along fit their characters and motivations, and the special effects/make-up that go with their abilities are very well done. Psi, for one, is a character I would like to see return, especially after his trick to distract the Teller of flooding his own mind with every wanted criminal in the known galaxy. This was a bit of an off-week for Clara. In Time Heist, she was along for the ride, and served the role of “the companion whose sole purpose is to ask questions and get in trouble,” much as she did last season with Matt Smith, though this time out Jenna Coleman didn’t have to make googly eyes at the Doctor. Coleman did just fine with this episode, helping draw out exposition from Psi and Saibra and serve as the companion in distress to be saved. This was just the first episode this season where Clara was just…there, and it was a bit jarring to realize that fact. It’s a good sign, though, as to just how great Capaldi and Coleman have been together and how much character development she’s gotten over the past few episodes. The Doctor is very “Twelve” in this episode, with Capaldi taking charge of Psi and Saibra without a passionate speech or uplifting words, but a cold pragmatism, reminding them that they must have agreed to everything before having their memories wiped. He admits to Saibra at a critical moment that he can’t save her, but she can save herself via the “exit strategy” that they discussed before forgetting everything. He realizes there’s no other way to get his memories back but to confront the Teller. And in the very end, the Doctor sets the whole thing in motion with one very simple note slipped to the right person. Capaldi has been channeling Jon Pertwee so far, but this episode could have come right out of the Seven Doctor era, with Sylvester McCoy and Sophie Aldred cracking into a bank through some convoluted plan. It’s during the climax where the time travel angle shows up, and one can see Moffat’s hand in it, but it’s Capaldi who sells it, with his mix of confusion, realization, and follow through. Although, the key portion of his plan, a moment where the bank would be most vulnerable, is something that you would expect the most secure bank in the galaxy to be WELL prepared for and have predicted in advance. It feels like this review is a little short than most (Thank Tom Baker, some of you are thinking. Thank Colin Baker, one of you is thinking. And I know which one. Don’t deny it). Time Heist is a very well done “heist” episode, one with no long-term ratifications to the overall seasonal arc that are readily apparent or major character development. It’s a straight forward episode from start to finish. That shouldn’t take away from the quality of this story, however. No pun intended, Time Heist comes off as a chance for viewers to sit back and enjoy 44 minutes of an enjoyable, well done bank caper. This entry was posted in Random Thoughts and tagged Doctor Who, Doctor Who Review, Jenna Coleman, Peter Capaldi, TARDIS, Twelfth Doctor. Bookmark the permalink. Agreed! I enjoyed the heck out of it.